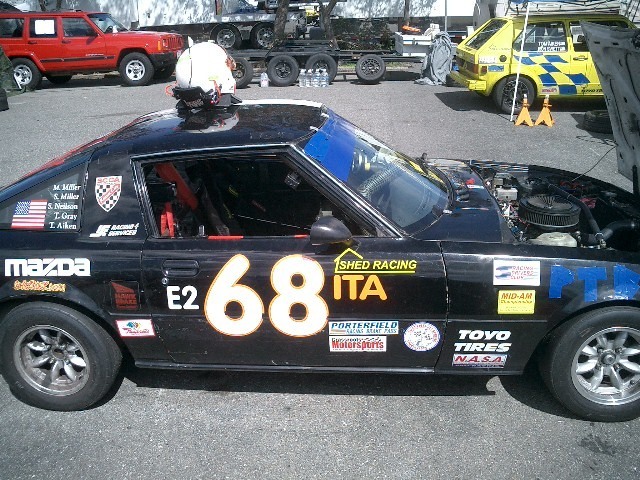 Shed Racing competed in NASA's second race of the year April 1st and 2nd at ThunderHill Raceway. 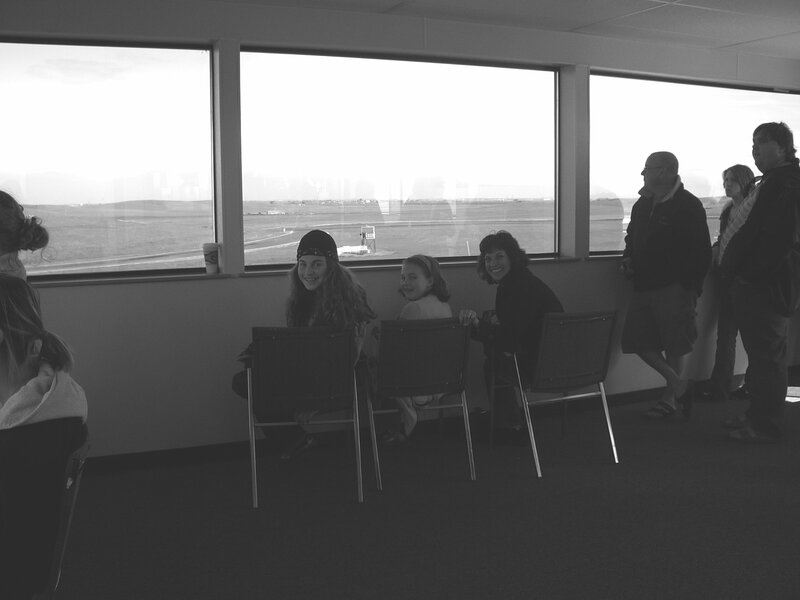 This time it was Ron Swett and his wife Cindy making the trip as Tom Aiken was preparing with his wife Shannon for the arrival of their son Alex who was due April 3rd. Side note Alex James Aiken is here, and every body is doing well. Congratulation to the Aiken family!!! Shed Racing decided to get an early start and left Fremont at 1:45 pm Friday, unfortunately I realized after driving for 45 min that I forgot to pack the tool box, doh!!! Cindy was following the RV and racecar in the Ranger and she graciously volunteered to go back for the tools, never a uneventful weekend when heading to the track, Thanks Sweetheart!! I pulled into T-Hill at 5:30 followed by Cindy at 7:30, the track was pretty empty and the weather was a bit wet and cold. Miller Motorsports arrived a short time later and Saturday morning Scott Neville pulled in. 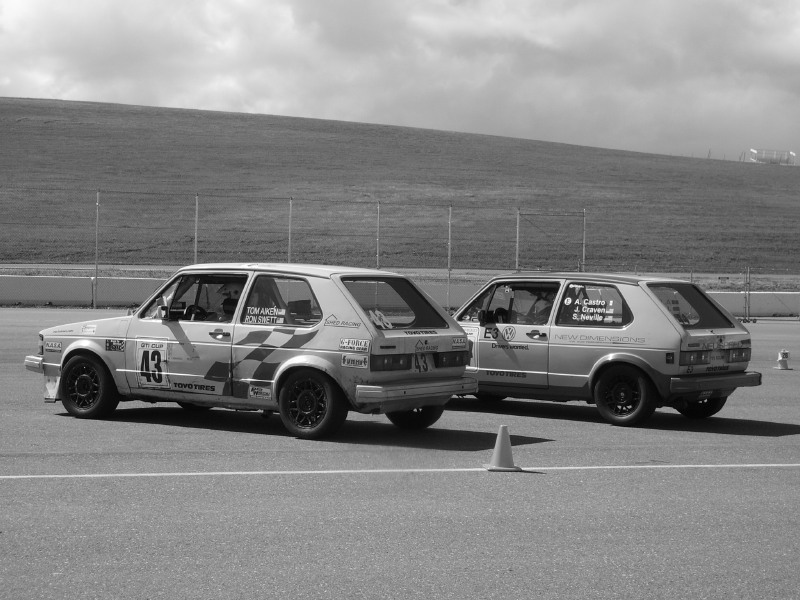 This would be a two GTI weekend. Saturday turned out to be dry and cool which is better than wet and cold, morning practice saw Shed Racing turn a 2:19.201 while Scott Neville ran a 2:16.361. After practice qualifying followed Ron, Scott, and Marcus from Miller Motorsports spent most of qualifying passing each other having a good ole time, as the RX-7 could not shake the two yellow Bunnies. 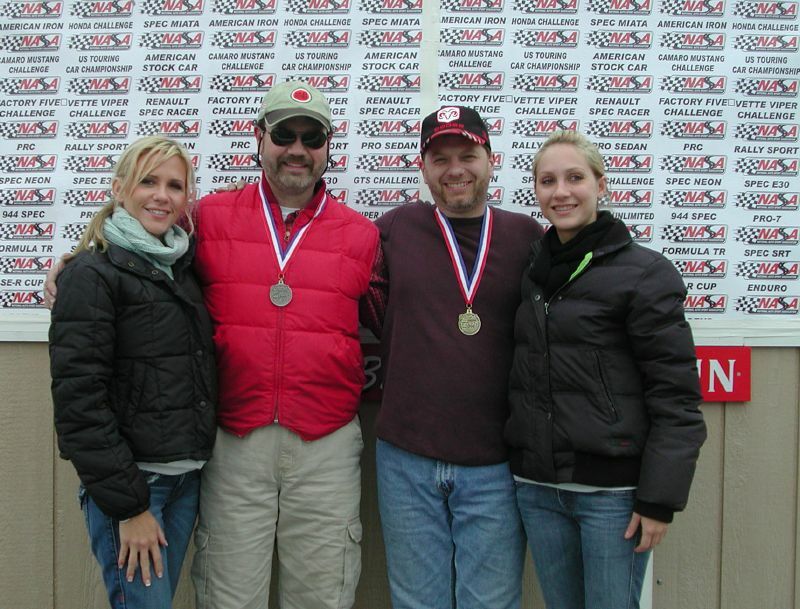 Once times were posted Shed Racing had earned its second pole of the year with a 2:15.653 to Scott’s 2:16.667. 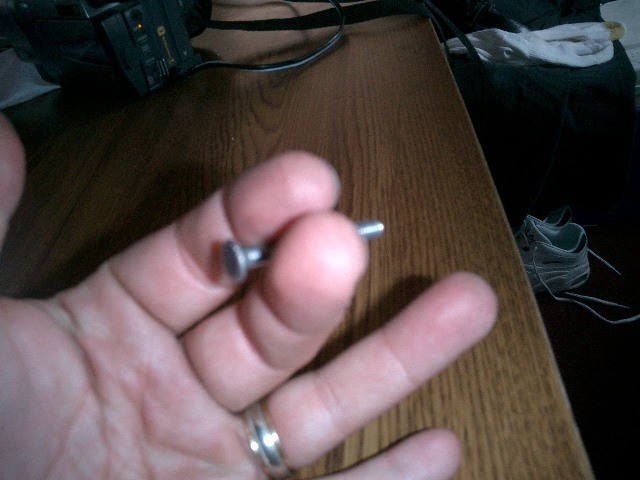 Side note: I made that screw, so you might say I screwed myself . My best lap out of 3 was a 2:15:824 Scott Neville turned a 2:16:281. Race win Saturday goes to Scott Neville, congrats Scott!! Scott's wife and kids made it out Saturday to see his win. The Kitty Cat pajama wearing crew chief makes a return visit. We were not as lucky with the weather Sunday, as we woke up to cold and wet. 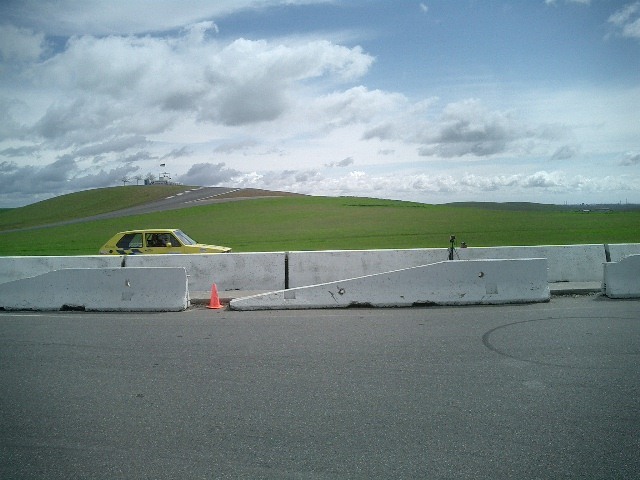 Scott, Marcus and I went out for morning practice I made it a whole 2 laps before more throttle issues came into play. This time the throttle cable came out of the pedal exiting turn 2, I coasted to a stop 3/4 of the way up to the hill to the crows nest. Then for the second time in my brief racing history I was towed back to the paddock. Fixing the throttle cable issue was nothing a few zip ties could not handle, and just like that we are ready to go again! Best time is practice me 2:31.731, Scott 2:16.421. Why is the pedal stuck to the floor?? Due to an altercation in turn 2 qualifying was cut short to 4 laps, for track cleaning and car removal from the very wet outside of turn 2. 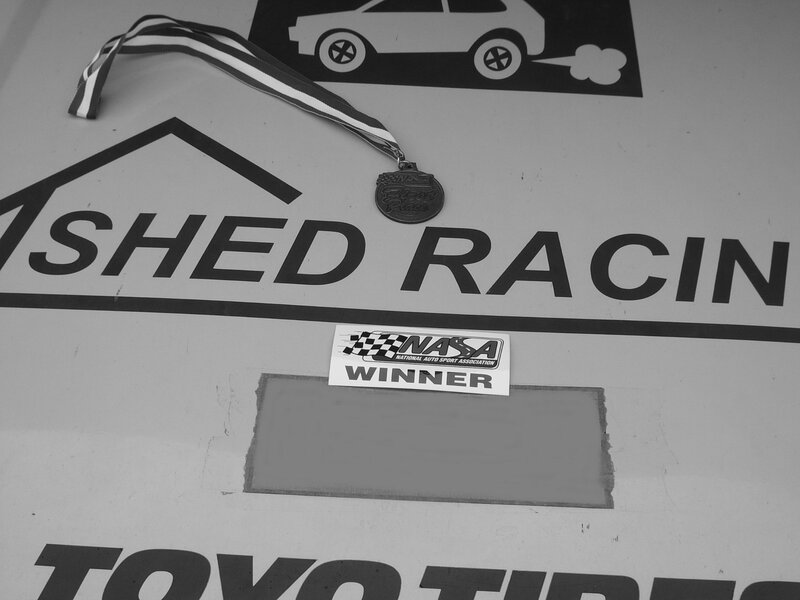 This turned out to be Shed Racing's 3rd pole for the year with a time of 2:17.058 to Scott's 2:17.578. 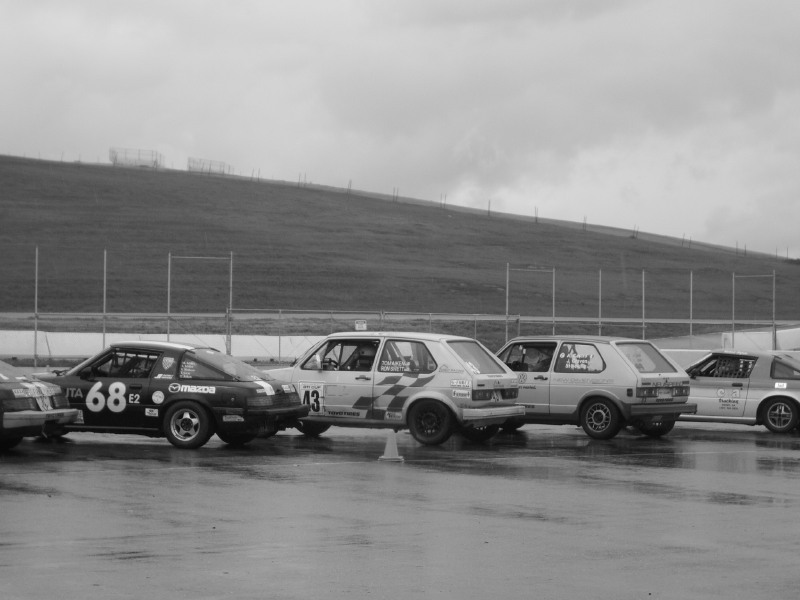 About an hour before the race it was clear that it would be a rain tire kinda race. With full tread race tires bolted on I headed for the grid. This works well for turns 1 through 3 however entering exiting 4 Scott gets way sideways and out of shape, I do the same. For the next few laps I follow Scott around, one thing I do notice is that Scott goes through 8 a little slower than me, I keep a mental note on that since it may come in handy and its the only place on the track I seemed quicker. With in the next couple laps, I get a real nice run through 14/15 and make a pass going into 1. Scott is right on me and I'm real nervous about not going off track or spinning in the slick conditions while trying to say ahead. So going into 8, I decide this a good time to try and get a little space between us. I go in a little harder than I had earlier, hoping Scott would back off a bit, he didn't. I got a little loose and went on, Scott got a bit lose and ended up spinning to the inside of 8!! He gets himself slowed down and headed in the right direction. At this point I have a pretty good lead and Scott is driving fast and consistent. With no one to run with, my laps times go up a bit and since Scott driving very determined his lap times drop. With 2.5 laps to go I lock up the brakes going into 14 and miss the corner completely. As we cross the line with 2 to go Scott is right on my bumper. I run the fastest line I can and Scott is trying left and right to get by. We battle hard with me putting a block on Scott during the last lap going into 14 and cross the line 0.351 apart. Shed Racing gets win #3!! My best lap 2:29.622 while Scott turned a 2:29.460.